Annabel Karmel is one of the UK’s most successful cookbook authors for children and families – with her first release selling more than four million copies. Talking everything from the baby-led weaning versus puree food debate, to encouraging fussy eaters and getting children involved in the kitchen, Annabel shares advice for cooking with kids. 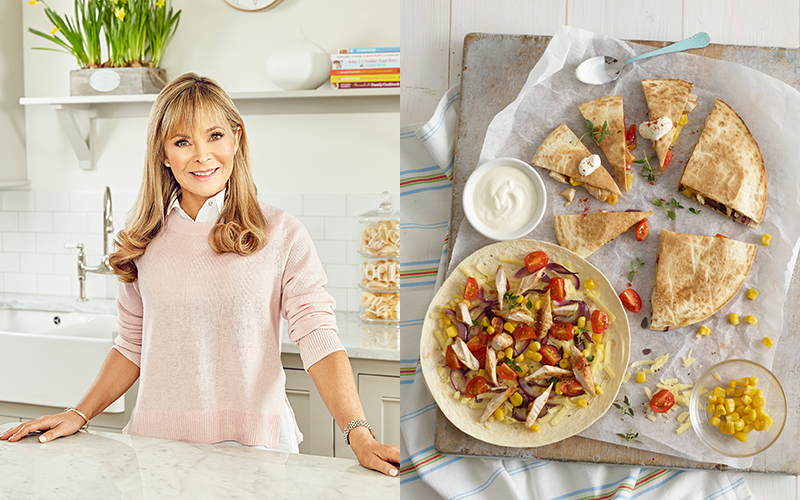 With a career spanning 25 years, London-born mother of three, Annabel Karmel, has pioneered the way families all over the world feed their babies and children. Credited with starting a food revolution with her trusty recipes and methods, she has become one of Britain’s top cookery authors for children, a best-selling international author, and the mother of all feeding experts with 41 cookbooks…and counting. With the sole mission of raising the standards of children’s diets, Annabel is a regular media commentator on food related issues, and she regularly undertakes consultancy work for major nursery chains, leisure resorts, restaurants and hotels worldwide. In 2006, Annabel received an MBE in the Queen’s Birthday Honours for her outstanding work in the field of child nutrition, and she has since become recognised as one of the UK’s leading female entrepreneurs. When Annabel tragically lost her first child, Natasha, to a viral infection when she was just three months old, she found herself feeling vulnerable. After giving birth to her son, Nicholas, Annabel wanted to give him the very best food – Nicholas however, had other plans. As a fussy eater, Annabel realised she’d have to pull her sleeves up in the kitchen to create flavour combinations and meals that Nicholas would enjoy – which is when she unintentionally discovered her passion and talent for children’s nutrition. Never in a million years did she think that her personal mission to find foods that Nicholas would like, would lead her to a successful career as an author, which spanned from strength to strength following the publishing of her first cookbook that sold over four million copies worldwide. She has since written 41 cookbooks for children, with another soon to come! Where did your drive and focus for children’s nutrition begin – did you always want to become an author? My niche was, and still is, making tasty recipes for babies and children because I love to cook. It’s from building credibility in this area that I was able to expand into writing. I lost my daughter Natasha to a viral infection when she was just 13 weeks old. It was this tragedy that led me into the field of child nutrition and it was then that I wrote my first book – The Complete Baby & Toddler Meal Planner. Prior to this, I was a talented harpist! What are the biggest misconceptions parents have about feeding their babies and toddlers? When I was writing my first book, I was told that babies and toddlers only liked bland food but it’s not true and that’s what I set out to disprove with my recipes. It’s more about giving parents the confidence to cook homemade meals for their baby and child including recipes that are packed full of flavour. There has been a lot of debate surrounding the ‘baby led weaning vs. puree food’ approaches. In your experience, what path should new parents be taking? Baby-led weaning is certainly having its moment and is the hot new weaning trend to try. I understand that for many, skipping the puree step altogether can be a scary thing but the view is that it gives babies the opportunity to discover lots of different tastes and textures from the very beginning of their weaning journey; encouraging them to eat a variety of foods and eliminating fussiness later on in life. That being said, there is no reason why you can’t mash or puree certain family meals if they’re not quite ready for baby-led weaning. The good news is, it’s completely up to you and what you feel comfortable with. I believe that adopting a flexible approach is a great way to get started and is often the most realistic for lots of families. Giving purees when your baby is ready for first foods (particularly if slightly earlier than 6 months), with the introduction of finger foods and family meals from around six months is a fantastic flexible option. There is no right or wrong to weaning – all babies are different and it’s about what works for you and your family. How do you get children to eat the foods that they ‘hate’? A blender might just become your new best friend! Vegetables can often be a bit of a barrier for many parents come mealtimes. Whilst it’s important to show children where they come from and help them understand why they are so important, if a child simply refuses to eat their veggies, try out some recipes which blend in veg such as a tomato and vegetable-based sauce for pasta, or mashed potato combined with grated carrot. It may sound simple but what children can’t see, they can’t pick out! I like making a Bolognese sauce packed with onions, leeks, celery, tomatoes, pepper, carrots and my secret ingredient, apple. It’s delicious. Preparing foods in different ways can also make a huge difference – for example, most kids I know wouldn’t eat boiled cauliflower, but roasting is a whole different ball game. Children also often like to eat with their fingers so serve vegetables like whole corn on the cob with a little melted butter or baked sweet potato wedges with a sprinkling of Parmesan. As a mum yourself, which recipes are your go-to at home? If I’m cooking for a crowd there is nothing better (or more satisfying) than a one-pot recipe – just chuck all the ingredients in and leave it to do its thing while you get on with other jobs. My One-Pot Roast Chicken is a delicious, easy, all-in-one meal that feeds the whole family. I also love Japanese food so anything with miso, mirin or rice wine vinegar – it gives a lovely sweetness to sauces and dishes. The Roasted Cauliflower from my Busy Mum’s Cookbook is so simple yet utterly delicious. The edges of the cauliflower caramelize when roasted and when you drizzle over my honey and rice wine vinegar dressing it elevates it way beyond a side dish. What are the biggest trends you’re seeing coming through in the nutrition industry for children at the moment? Vegan is definitely the buzz word of the moment and there is also a real focus on healthy eating in general. There are lots of health benefits associated with veganism, however, parents do have to be extra careful to ensure their child is getting key nutrients mainly in the form of protein, calcium, Iron, Vitamin D, Vitamin B12 and fibre for their development and long-term health. I think it’s great to include a number of different foods from an early age and I personally like the age-old saying of ‘everything in moderation’. Coming up with fun and healthy ways you can prepare food together is a real winner rather than focusing on so-called ‘bad’ foods and denying these. ‘Treats’ are treats and should be seen as such. This way, your child will develop and grow up with a healthy relationship to food. Of all your books, which has been your favorite to date and why? That’s a really tough one as they all mean something to me in their own way. However, I will have to say the first book I wrote, the New Complete Baby & Toddler Meal Planner as it’s where it all started for me. Never in my wildest dreams did I foresee that this cookbook would go on to sell more than 4 million copies, or that it would become the 2nd best-selling non-fiction hardback of all time! Particularly for the busy parents out there, what store cupboard and freezer essentials would you recommend always having at home? Family cooking shouldn’t mean spending hours in the kitchen cooking food. It’s about finding solutions that work for your family, and often that means quick and balanced meals which are super-simple to prepare and taste delicious. My advice would be to have a well-stocked store cupboard so even if you haven’t had time to go to the shops you can still cook-up a healthy nutritious dinner for the whole family. After all, it takes no time at all to create a quick tinned tomato based pasta dish such as my Penne all’Arrabbiata or use a tin of chickpeas to make mini falafels or a quick hummus. If in doubt, eggs are my staple ingredient as you can always whip up a quick frittata in minutes! Batch-cooking has always been my saviour. If I’m making a Bolognese for example, I’ll make a big batch and then freeze individual portions or make mini cottage pies in individual ramekins so I can quickly grab these out of the freezer for an instant hassle-free meal. What kitchen tools do you find come in most handy for assisting parents when making meals for children? A food processor is an essential – it makes life a lot easier; great for blending a vegetable based tomato sauce (for those hidden veggie detectives out there! ), soups or some quick mini energy balls. I also love using a spiralizer – simply baking sweet potato curls in the oven with a little salt and pepper turns them into the most delectable dish. Kids will also love to get involved in magically transforming veggies into spaghetti. What ways can parents help their children to learn how to cook? Children can actually help out earlier in the kitchen than you might think. A young child is capable of rolling out dough, cracking eggs, whisking mixture etc. It’s also a good way of helping them learn where food comes from and instilling a love of good homemade food. When my children were 4, 6 and 7, I encouraged them to cook supper for the family every Friday. I would help them with things like chopping up vegetables but soon they learned how to handle kitchen utensils carefully and that you need oven gloves to put food in the oven. You need to teach children these things otherwise they will experiment without guidance and that’s much more dangerous. Most children take great pride in cooking and being part of the adult world. The only downside is the mess! Do you have any exciting, new cookbooks in the pipeline? I do. I have a new book launching next year which will focus on real food toddlers and kids will love. I want to focus on all the things mums really want such as 15 minute meals, healthy versions of fast food favourites and one–pot saviours. There will also be dairy free and egg free recipes (the two most common allergies in children), vegetarian ideas and lots more. Visit www.annabelkarmel.com for more information. If you liked this article, you may also like these baby-weaning recipes. Previous Post&LeftArrow; Previous Annabel Karmel’s cooking tips for UAE parents: Is your child a picky eater?